I OFTEN wonder how many people head down from a day on the mountain blissfully unaware that they haven’t actually reached the summit. It happens more often than you might think. 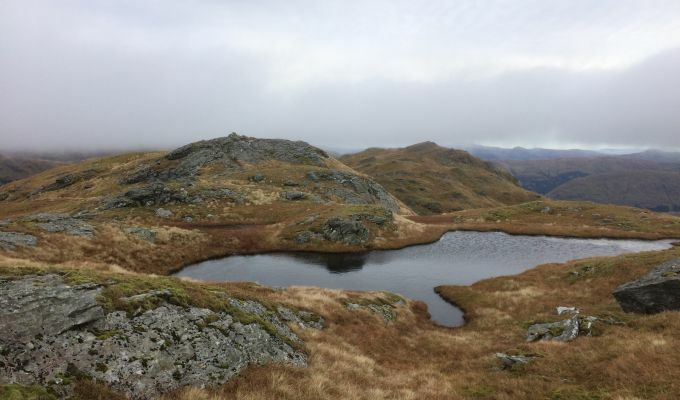 Some may realise their mistake later and rectify it but there must be others – maybe even some who think they have climbed all the Munros – who have got it wrong. I remember sitting above the clouds at the true summit of Spidean Coire nan Clach on Beinn Eighe and seeing a walker approach the big cairn a short distance below. Believing he had reached the highest point, he then turned and headed back down. This came to mind on a recent visit to Beinn a’ Chroin at Crianlarich. This mountain has been at the centre of discussion for many years over which of its high points is the true summit. When I first climbed it in 1993, the 940-metre East Top was regarded as the summit, with the West Top marked at just 938m. However, we visited both summits like good little mountaineers, as we did with so many other dubious tops. You can’t be too careful. For many years, there had been rumblings that the West Top was higher. In 1997, there was a raft of changes to the Munros list, but not a mention of Beinn a’ Chroin. The East Top still seemed to reign supreme. Somewhere between that time and the publication of the new and updated SMC Munros book two years later, the change was made, largely under the radar. Now the West Top was said to be 942m, trumping its eastern buddy, and that’s where we stand today. Except there are claims that neither is actually the high point – some independent measurements have pinned that to a cairn midway along the ridge. To add to the mix, there is a large cairn before you reach the West Top. This is thought to have been the source of confusion about the position of the original West Top reading. Anyone reading this will likely play it safe and go to all four cairns on this knobbly ridge. They are not far apart and it doesn’t take too much time out of your life. That’s why I was surprised to see a guy reach the West Top, then turn round and head back the way he came. If the centre point is ever inaugurated, he’s going to regret his hasty retreat. When the 1997 changes introduced seven new Munros, there were collective sighs from those who had dashed up to the main top of the likes of Buachaille Etive Mor and An Teallach, ignoring the rest of the peaks on those ridges. I admit we felt somewhat smug that we hadn’t fallen into that trap. If we were on the hill, we did the whole ridge. That lesson also applies to Maoile Lunndaidh. 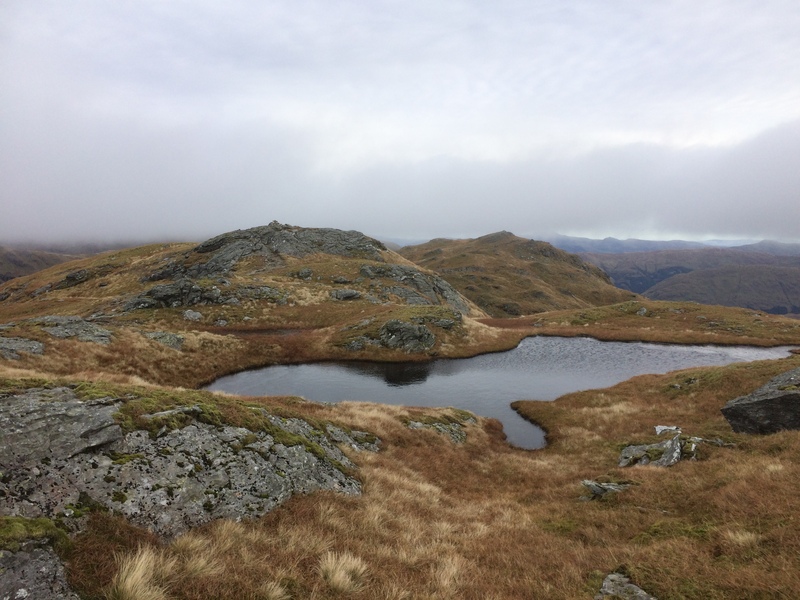 The chosen Munro summit sits on the eastern arm of a great horseshoe, but recent measurements have suggested that it’s lower than the cairn on the western high point, Carn nam Fiaclan. I have always done the full horseshoe, the bonus being the view down into two magnificent corries. There have also been contentious summit issues on Beinn Teallach and Beinn Achaladair, and there are quite a few Corbetts which sport multiple cairns. And when you get down into the Grahams, well, all bets are off. Then there are the mountains w(hich have cairns which seem to be positioned deliberately to bamboozle you. I have already mentioned Spidean Coire nan Clach but what about Carn nan Gobhar in the Mullardochs? Or Beinn Dorain? Large cairns in prominent places on the way to the main summits have confused many in thick mists. It happens to the best. 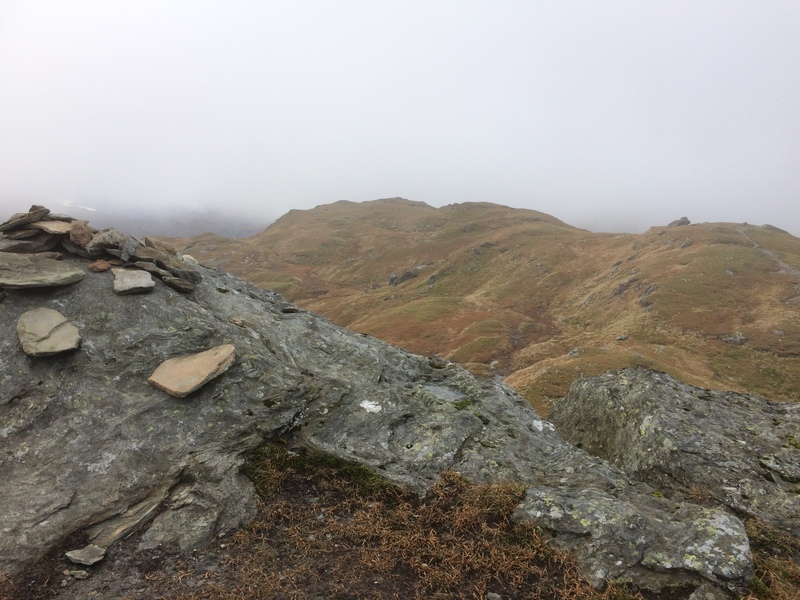 One friend was convinced he had summited Ben Lui many years earlier, his error only coming to light when I showed him a picture of the main cairn. A few swear words and a few weeks later, he was back off to get it right. FOOTNOTE: My thanks to Alan Dawson, heightings expert and author of The Relative Hills of Britain, who wrote: The highest point of Beinn a' Chroin is definitely the West Top at 941.4m (NN38751857). The East Top is 940.1m (NN39391859). The highest point on Beinn Achaladair is 1038.6m (NN34464324), while on Maoile Lunndaidh, it is Creag Toll a' Choin that is higher, not Carn nam Fiaclan.